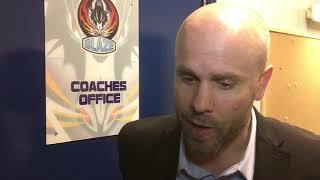 Despite another fight back from behind, Genting Casino Coventry Blaze’s defensive mistakes ended up costing them dear in a 6-5 defeat to the Belfast Giants at the SSE Arena. Coventry made their first trip to Ireland without Swedish forward Thom Flodqvist who joined American Jake Hansen on the injury list. The league title chasing Giants got off to a blistering start scoring three unanswered in the opening period. Jonathan Ferland first registered shorthanded at 8.27 before Patrick Dwyer (11.08) and Kendall McFaull (16.00) made it 3-0 after 20 minutes. As has become a common feature of this year’s Blaze team, there was no quit as Danny Stewart’s men hit four back in the middle twenty. Dustin Johner’s powerplay effort (30.54) being the only response for Belfast. The Blaze goals coming from the league’s leading point scorer Ben Lake (23.11), his 13th straight game with at least a point, Alex Nikiforuk (32.33) with his 17th of the season and a double for the in-form Shawn Pauly (33.54 and 38.27). With the score tied 4–4 it was all to play for in the third and at 48.19 it looked as though Coventry might have pulled off another miraculous come-back escape as Ross Venus put them 4-5 ahead shorthanded (48.19). However, the defensive errors that have become a huge frustration to coach Stewart in recent weeks finally came to bite his team as the Giants through Josh Roach tied the game with their second powerplay effort of the night at 51.37. 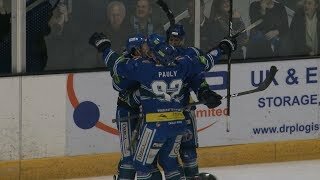 With the clock ticking down, Darcy Murphy picked up good speed and was able to skate from one end of the ice to the other, dangling his way past all five Blaze skaters and finally beating a frustrated Matt Hackett with a tidy finish to win the game 6-5 (58.32). Still angry about an earlier delay of game call, on the buzzer Hackett was to receive a game misconduct penalty for abuse of official.